While obvious on the surface, understanding the subtle difference between a life journey to "somewhere" and a life journey to "somewhere you desire to be" will determine how satisfied you are with your life and the decisions you make along the way. Jackson and Grimes share a novel approach to this subject. In this book, they show you that it is really how we make important decisions that will determine how happy we are. And that there is a special set of information about yourself that can point your decisions in the right direction - like a compass. Without that special information about ourselves we are susceptible to great periods of wasted time, pain and suffering. 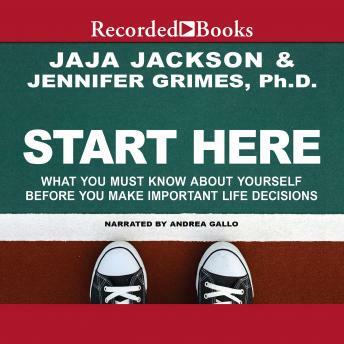 Jackson and Grimes have gone to great lengths and research to create a method to help you make the important decisions that determine your destiny - not just any destiny, but the destiny that you are guaranteed to appreciate and enjoy as you live it. This is a fast, fun read, appropriate for all people over age 14. It is especially useful for people when they are experiencing transitions or life changes like: - Graduation from high school or college - Birth of a child, retirement, or "empty nesting" - Death, Divorce or other psychological trauma - Marriage, Bar or Bat Mitzvah - Career change or job loss - A monumental birthday like 18, 21, 30, 40, 50, 60, 100 .you get the idea. So enjoy Start Here yourself, or give it to a person you care about who is experiencing life change. It's never too late and it's never too early. The right time.to have the key to unlock your best destiny.is right now.